When we first arrived at the colonial style house that Earl and Cindy had called home since its construction in 2001, we were excited for an opportunity to work on the property. The home itself was architecturally interesting and the landscaping was spot on. 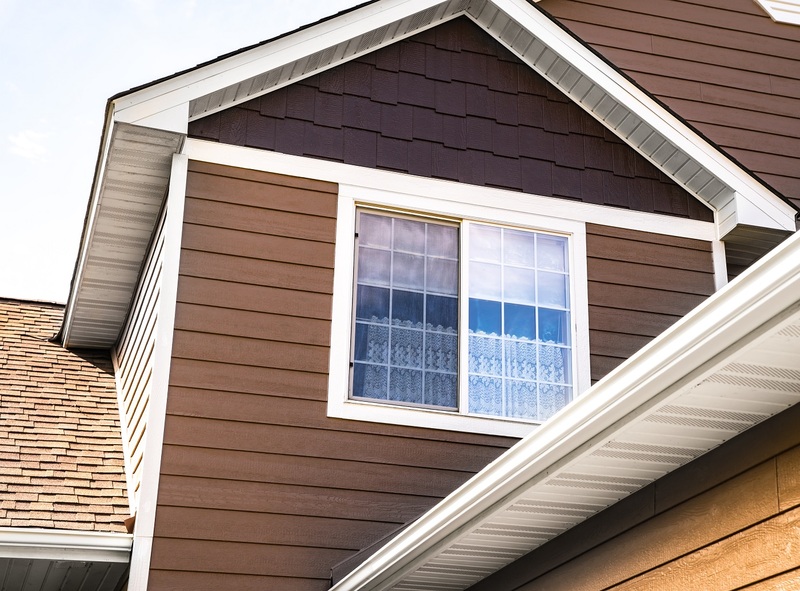 Although the house was less than two decades old, the couple was interested in learning more about LP® siding installation. Recently, they’d noticed dry rot in their garage and they wanted to correct the situation before further damage could take place. We found the cause of the dry rot to be because the brickwork on the home lacked enough of a downward slant. This allowed rainwater to run behind it. 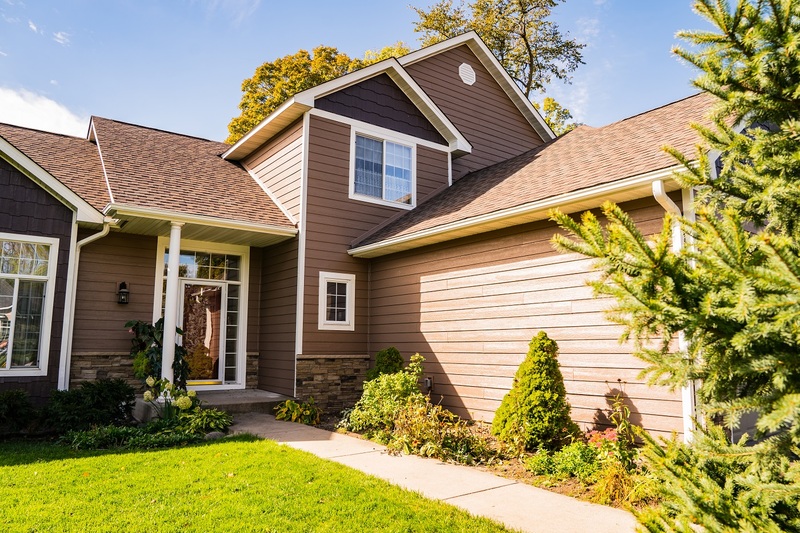 A second argument for the installation of new siding was creating a more visually attractive home. 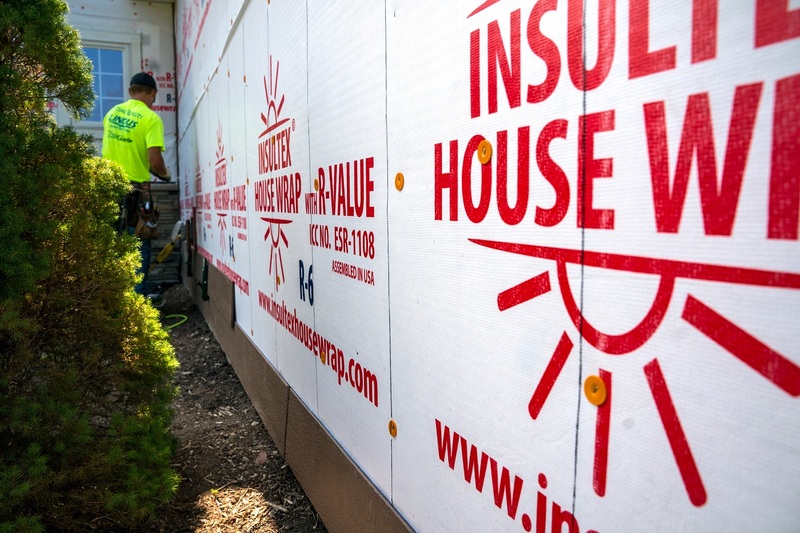 Here are the products we installed to improve the home’s curb appeal and energy efficiency. 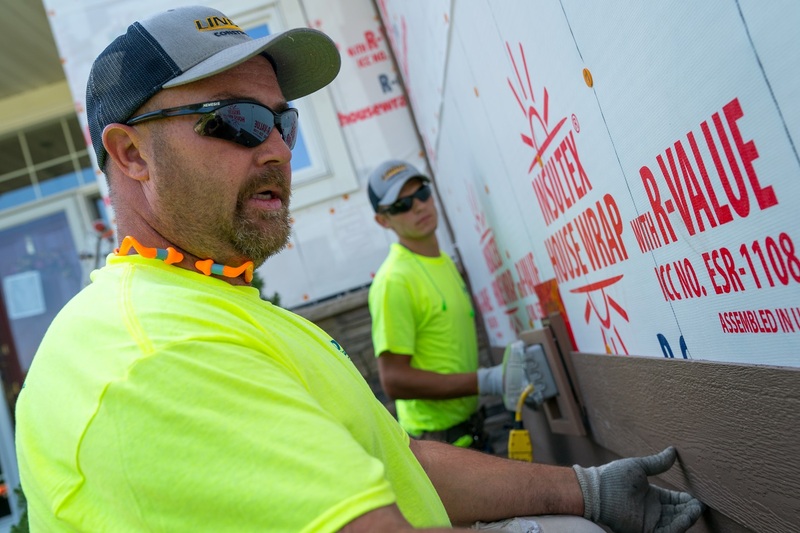 While the siding itself is important to the home’s overall comfort level, and even bigger point of consideration should be the house wrap used. 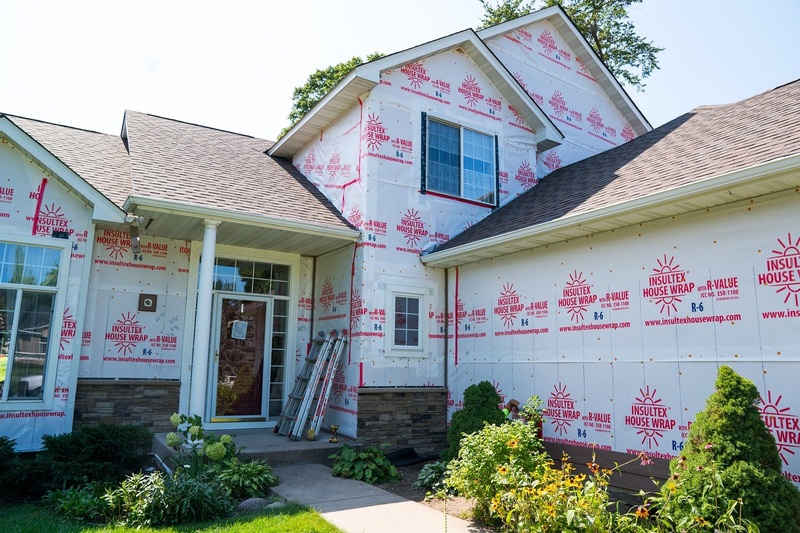 Like a majority of the homeowners we work with, Earl and Cindy chose to have Insultex™ House Wrap® installed. This material offers a R-6 insulation with a built-in drainage plane that acts as a dry rot preventative. 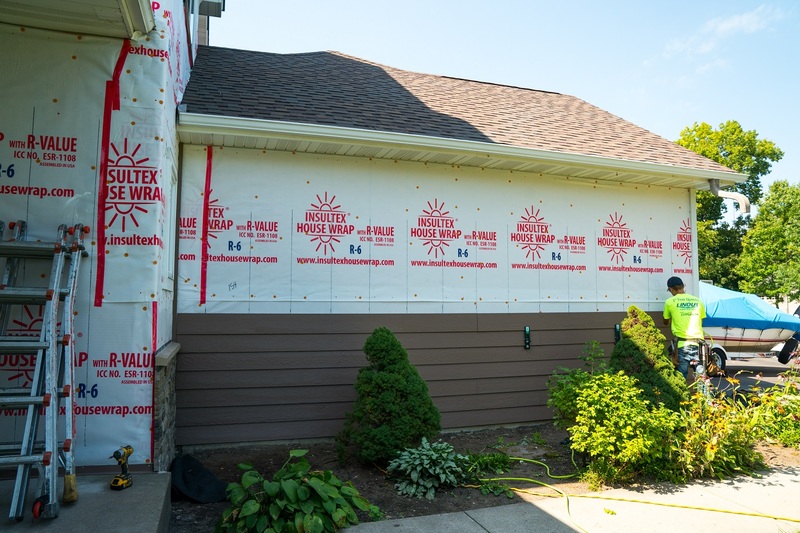 The use of this material in tandem with proper home sealing techniques creates an environment an optimum siding installation. 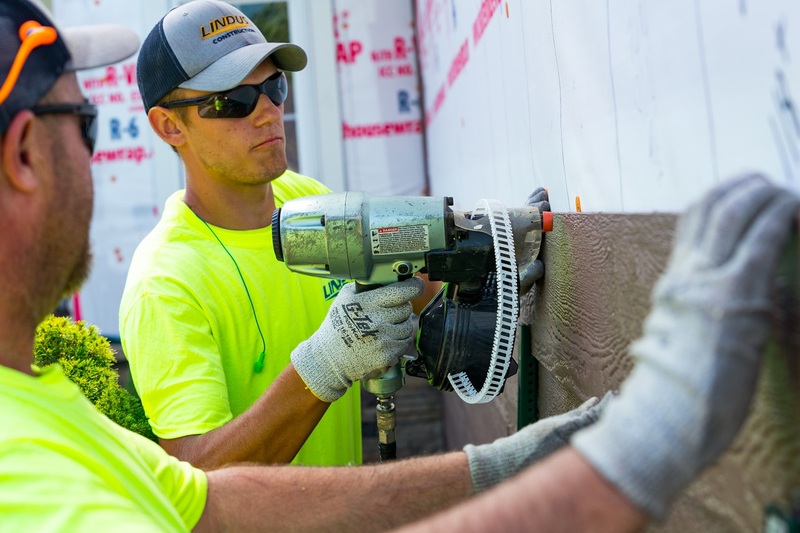 Used in tandem with LP® SmartSide®, a tighter home building envelope is created. In terms of bang for your dollar, curb appeal and longevity, LP® SmartSide® reigns supreme within the marketplace. Wanting to forgo future dry rot issues, the couple was delighted by the fact that when water comes in contact with the material, it beads up and is not absorbed. 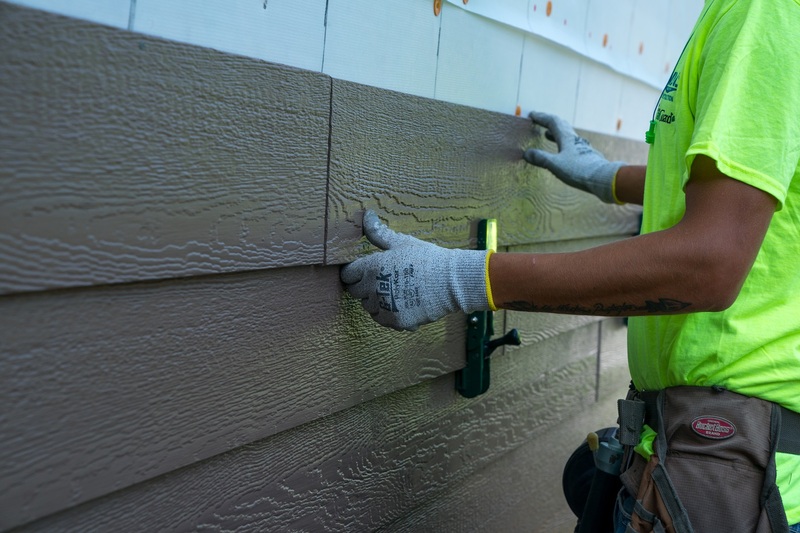 LP® SmartSide® is impact resistant and is faster to install than fiber cement. 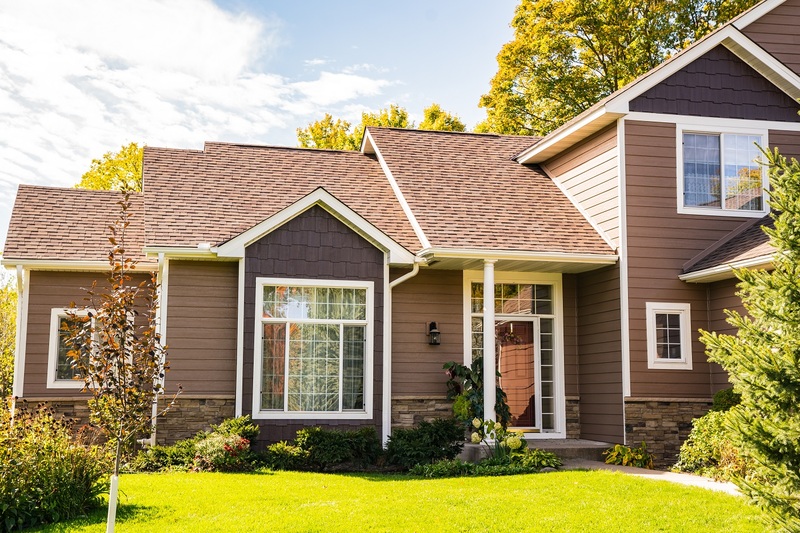 Another appealing aspect of the utilization of this material is that it comes in an array of house siding colors and configurations. Earl and Cindy embraced this fact and used it to create a custom exterior. On the front of house, they opted for 7” lap siding. Staggered edge shakes added interest to the home’s gables. Around the windows, 4” LP® trim was installed. White was used to provide contrast. 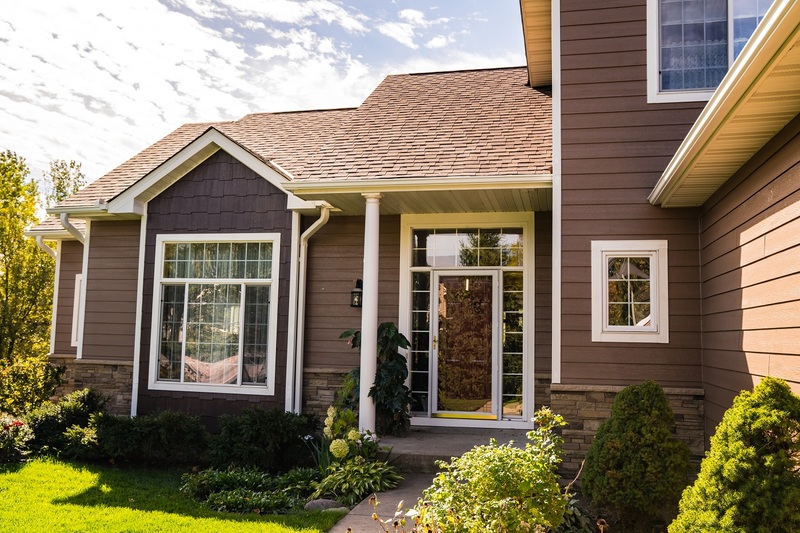 All of the home’s LP® SmartSide was prefinished in Diamond Kote®. This finish is accompanied with a 30-year warranty against major weathering factors due to its hard finish. This makes it an ideal solution for the rampant Twin Cities temperature swings. 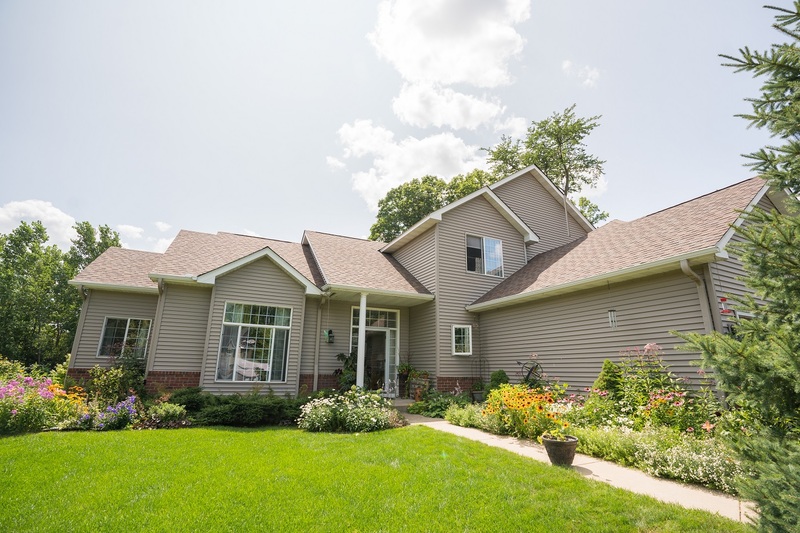 Earl and Cindy decided to replace the brick on the home’s exterior with a more modern material. Versetta Stone® ledgestone installed along the base of the home proved to be the perfect fit. Versetta Stone® is a cement-based veneer. Rugged in appearance, it is accompanied with a 50-year limited transferable warranty. An advantage the material has over natural stone is consistent coloring. It is lighter weight than stone, putting less stress on a home. The utilization of mechanical fasteners during installation makes it a swift process. The couple opted for varied hues of brown and beige, which tied in perfectly with the rest of the home’s color concept. 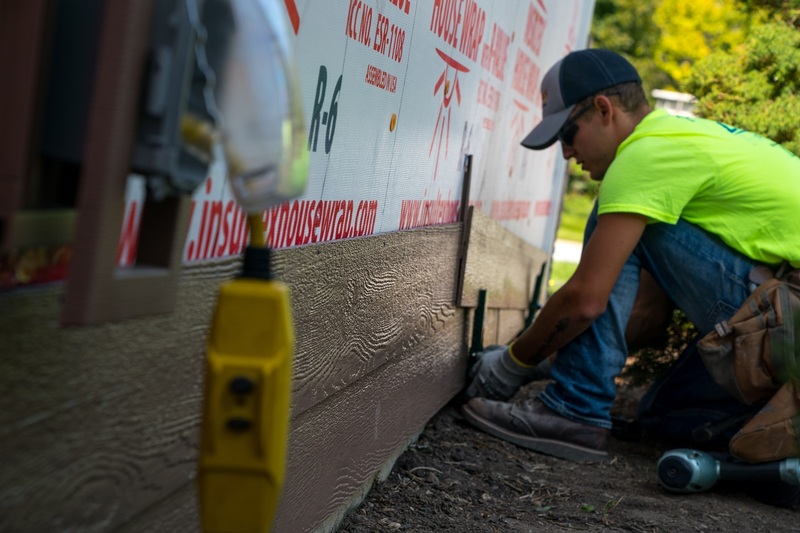 Watch the progress of the siding installation! 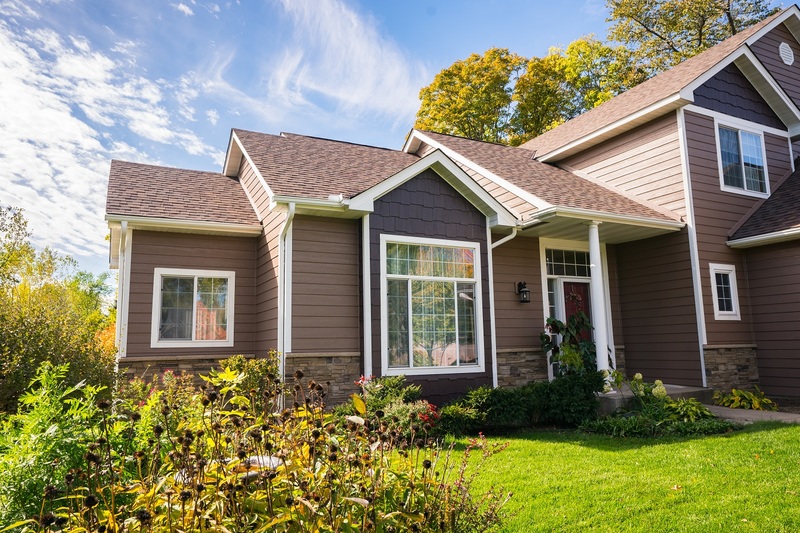 The preexisting vinyl siding & house wrap were removed in preparation for this project. 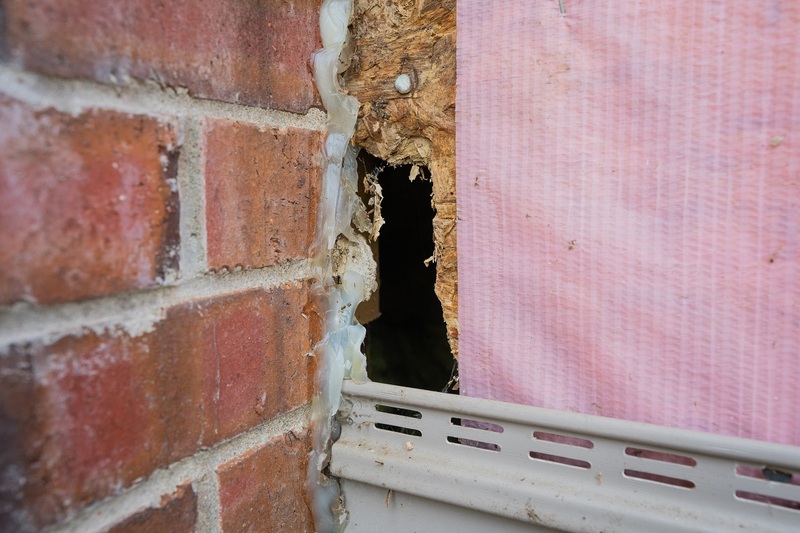 The tear-off process revealed dry rot due to manner the brick was installed. 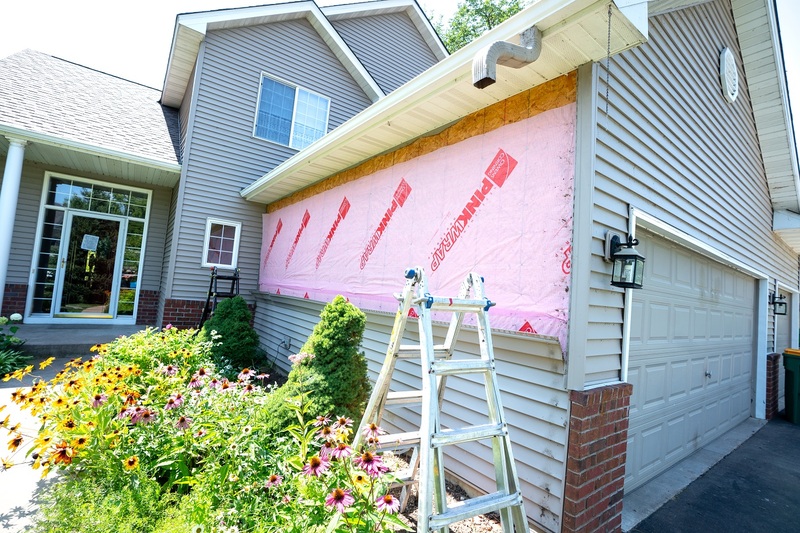 The previous vinyl siding was carefully removed. Special care was taken to not disturb the home's landscaping. 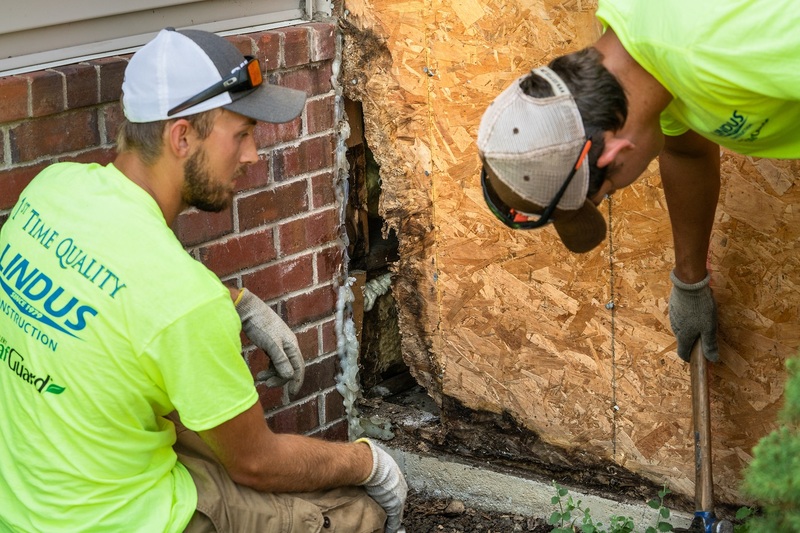 Once the extent of the dry rot was determined, our team addressed the issue. The dry rot in the garage's interior was extensive. 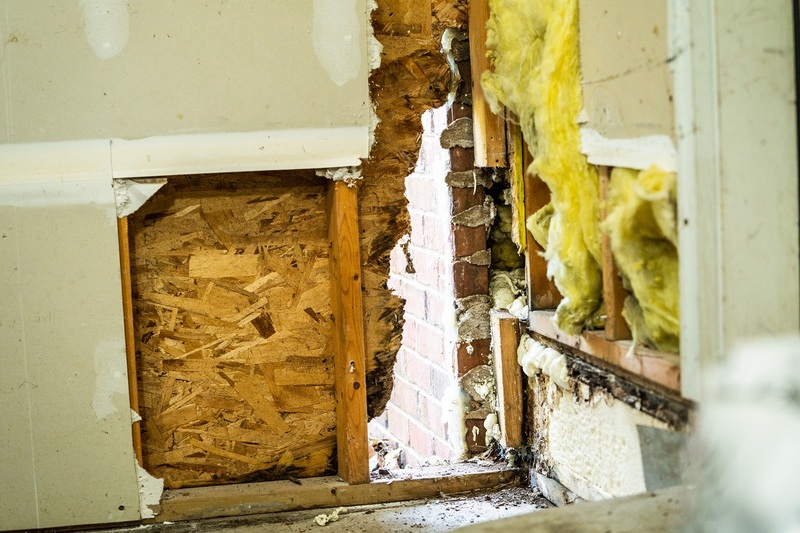 Our team removed the OSB that was damaged by dry rot. 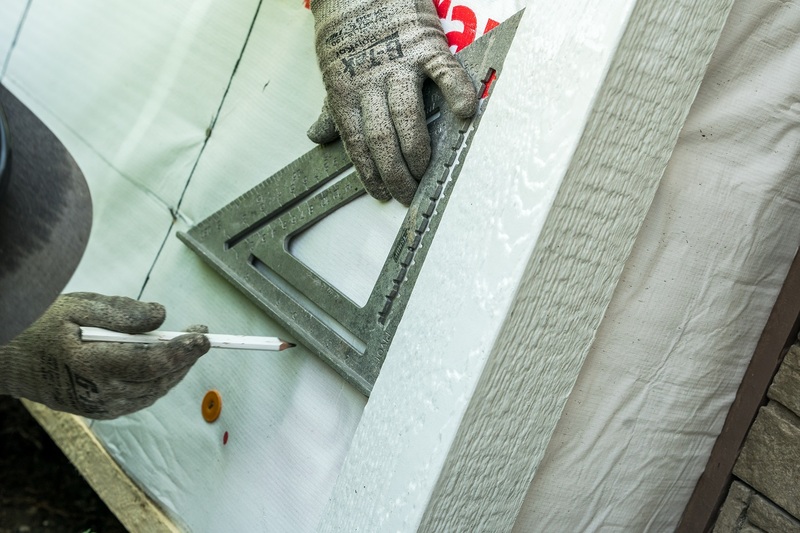 Cutting the LP® SmartSide® to the appropriate length. Gecko gauge clamps allow for a single person to install a length of LP®. Cap nails prevent water leaking behind the underlayment. 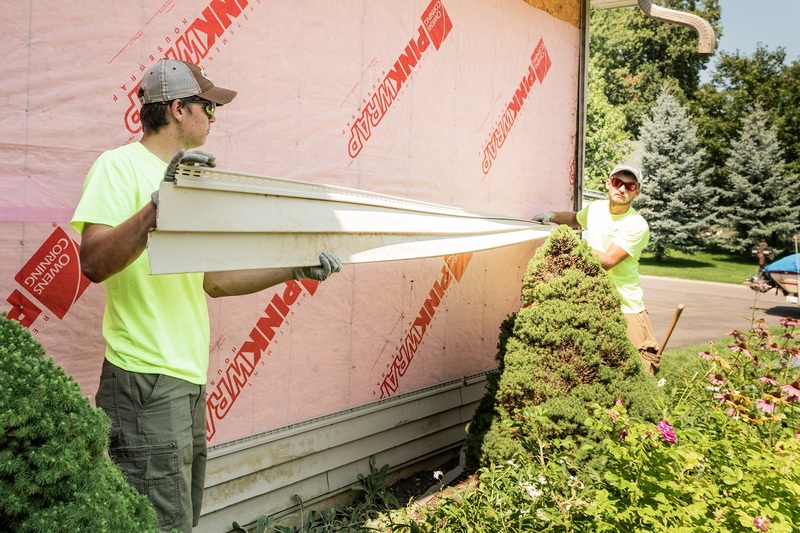 H-clip installation allows the siding to expand and contract as needed. 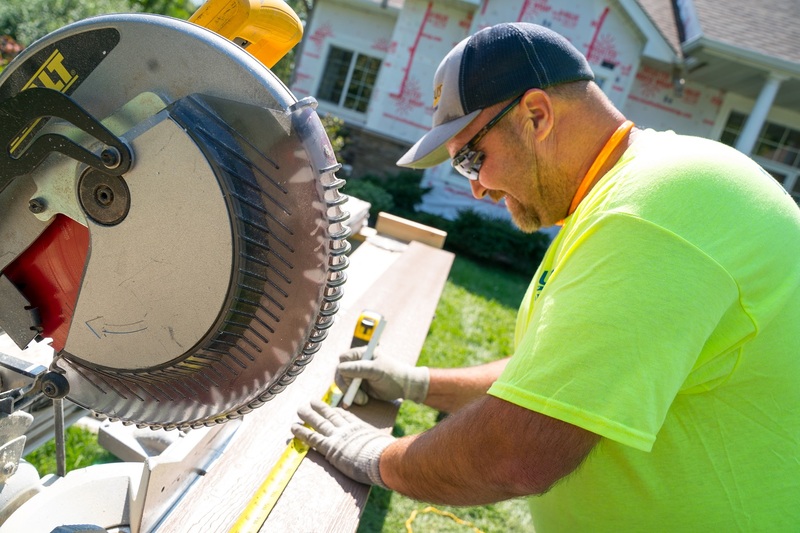 Protective glasses, ear plugs, and gloves keep the installer safe while cutting the LP®. The triangle ruler is used to verify there is enough room for siding to expand an contract. 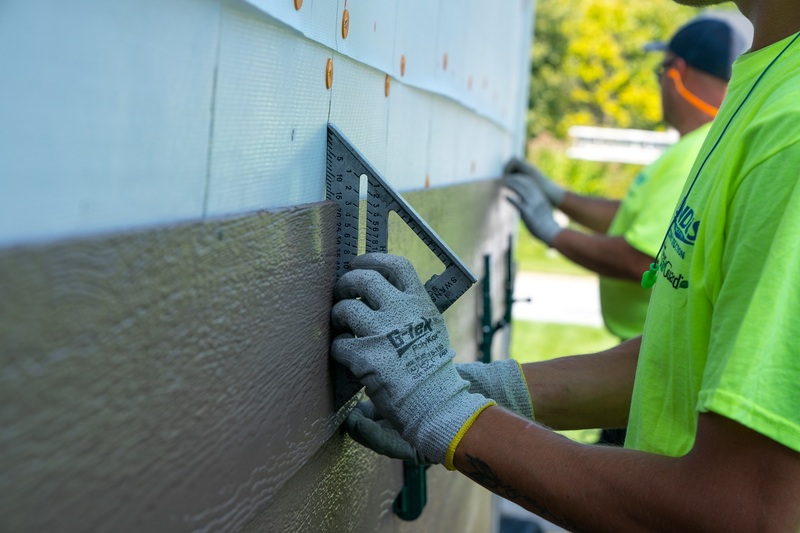 A level is used to verify siding is being installed in a straight line. 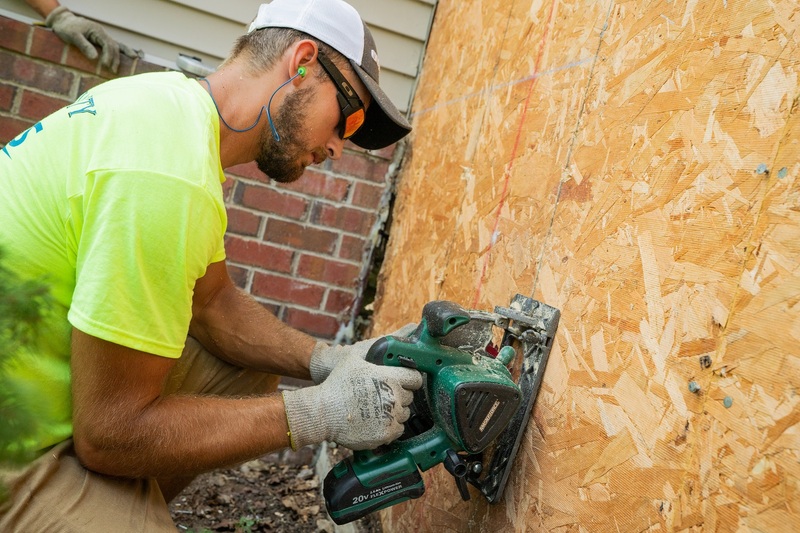 The pressurized nail gun is used to ensure a smooth installation. 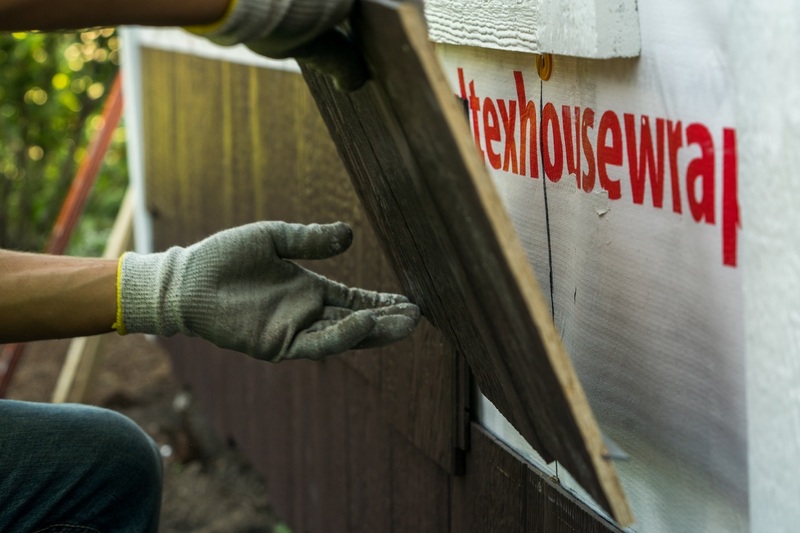 The blue horizontal lines on the Insultex® act as guide to show installers where the home's studs are. The first piece of siding is positioned one inch below the foundation. 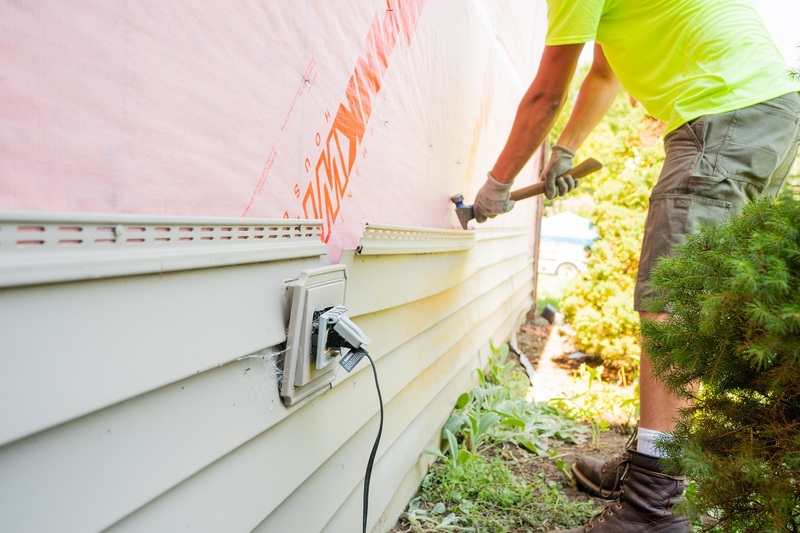 Special measures are taken to ensure the siding reveal is consistent in all areas. All of the LP® SmartSide® was prefinished in Diamond Kote®. 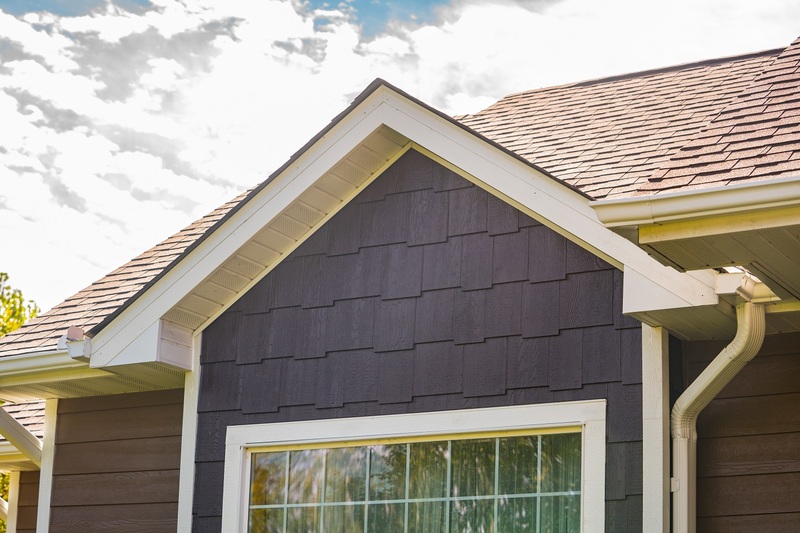 Staggered edge LP® shakes were installed on the home's gables to add interest. 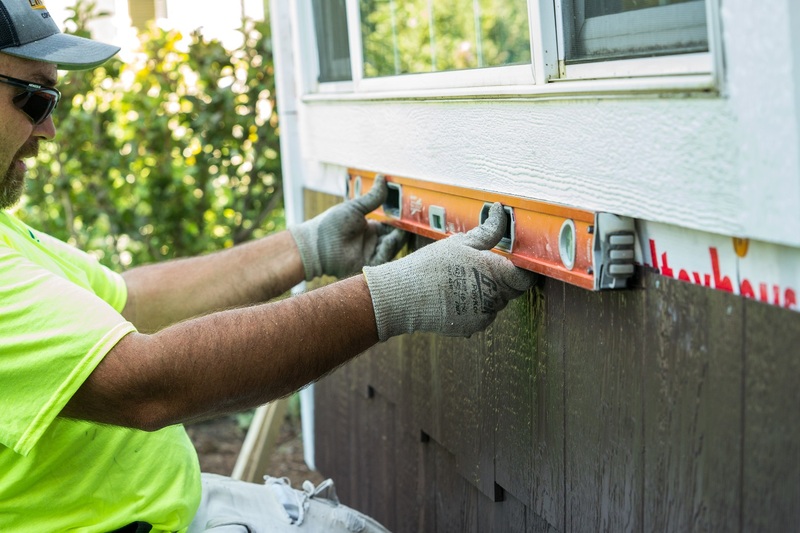 The installation techniques we used ensure maximum lifespan of the LP® SmartSide. 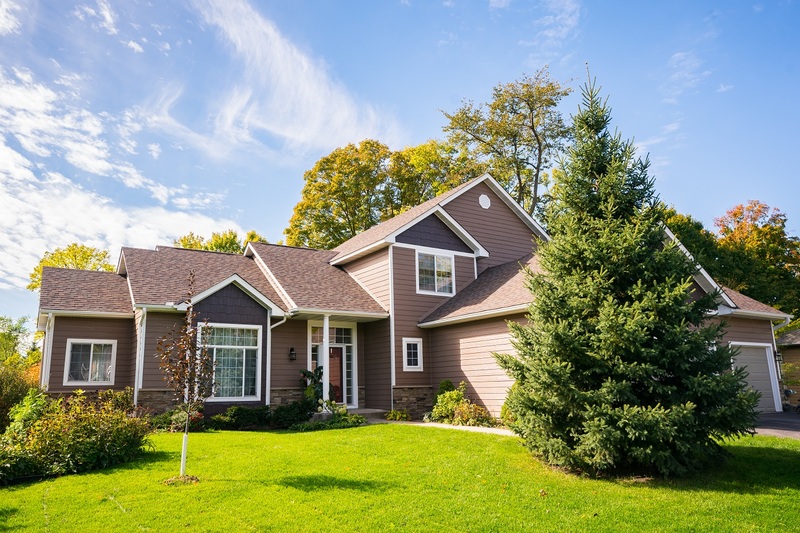 The combination of colors and materials used greatly enhanced the home's curb appeal. 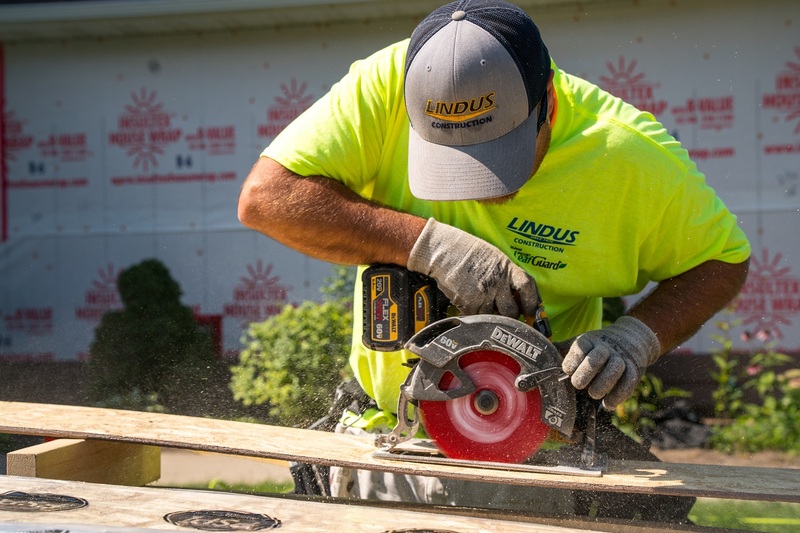 "We’ve had an excellent experience with Lindus from the very first sales visit to completion of the work, which included putting in an egress window, metal roof and skylights. All the crews we interacted with were extremely professional; workmanship was high caliber; and their commitment to customer service and satisfaction has made the entire experience great. Would highly recommend." - Sandro G.
"The Lindus team was exceptionally professional and efficient in their installation of LeafGuard® Brand Gutters. We are pleased with the look of the gutters. " - Terry K.
"Excellent job. Arrived on time, cleaned everything up when job was completed; installers were very competent and helpful with any questions I had." - Marilyn B. "The workers were great, we're very happy with the results. I want to mention our sales representative, Mitch. He was great: smart, professional, very thorough." - Denny H.
"Everything went fine the roof was almost done in one day. Gutters were done a few days later. Very satisfied." - Laurie S.
"I give you 5 stars. The gutters are beautiful!!" - Susan H.